The S&P 500 has mounted a relentless 16% rally from the December lows, successfully engineered by the "Plunge Protection Team" (a Christmas present from the Treasury Department) and a full capitulation from the Federal Reserve on monetary policy. While the magnitude and breadth of this historic rally has been impressive, we do NOT think this thrust invalidates our Bear Market thesis, and in fact believe the current set-up represents an ideal opportunity to add more leverage on the short side. Global economic indicators have accelerated to the downside, especially in Europe, which may already be in recession. While the Fed is watching stock prices more than the economy and has clearly made a dovish policy shift with respect to rate hikes (we never expected more hikes anyway), they are still reducing the balance sheet, which will remain a drag on global liquidity (see our last note – watch what they do, not what they say). 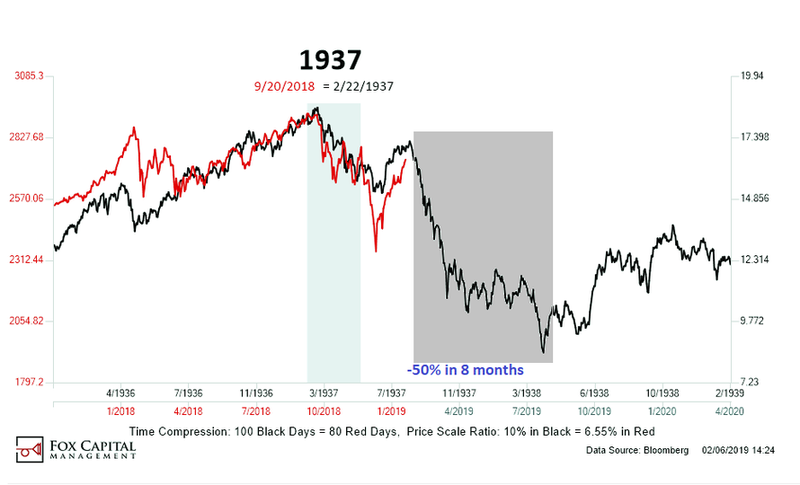 We have carefully studied the dynamics of every bear market in history, and while this rally off the December lows has been larger and technically stronger than we expected, such counter-trend rallies are common, with a median of five 10%+ rallies during all bear markets since 1900. The character of these bear market rallies is difficult to predict, but when whiplash like this happens in a confirmed bear trend, more often than not it represents a compelling opportunity to add exposure to the downside scenario. Make no mistake, the bear market pattern is still very much intact. Whiplash like this is very common in bear markets. Since 1985, forward returns for stocks have been much weaker than average after a 19%+ rally from a one-year low in the NDX (a signal that just registered this week). More often than not, these ferocious rallies took place during bear markets, and did not mark the beginning of a new bull run. Given the deteriorating macro backdrop, we believe this rally should be sold, and that hard assets like Gold will significantly outperform stocks as we continue along this larger down-cycle for risk. As a reminder, bear markets evolve in distinct phases as depicted below. The first down leg is generally a decline of about -11% in 50 days (median results). This is followed by a re-test rally of 8% over 29 days. 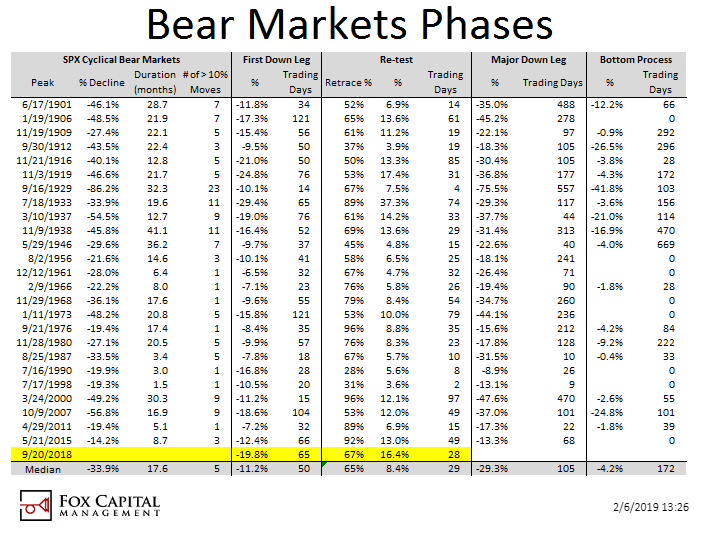 After that re-test fails, the dreaded major down leg phase ensues, with a median decline of -29% over 105 days. We believe we are now entering the major down leg phase right here right now. While this recent re-test rally of 16% has been well above average, it fits proportionally with the greater than average first down leg of -20%, and the time duration for both phases has been consistent with norms. This suggests that the major down-leg ahead should be at least as painful as the median decline of -29% during the next phase. Buckle up. Global economic indicators are weakening by the day, especially in Europe and China, and confidence is on the wane. Last week, consumer confidence fell again, now down 17 points from near record highs. In the past, when this reading has dropped 17+ points after reaching a new high above 100, forward results for stocks have been much weaker than average, and hard assets like gold have drastically outperformed stocks as the inevitable monetary stimulus (currency debasement) and/or a flight to safety drives investor flows away from paper assets. 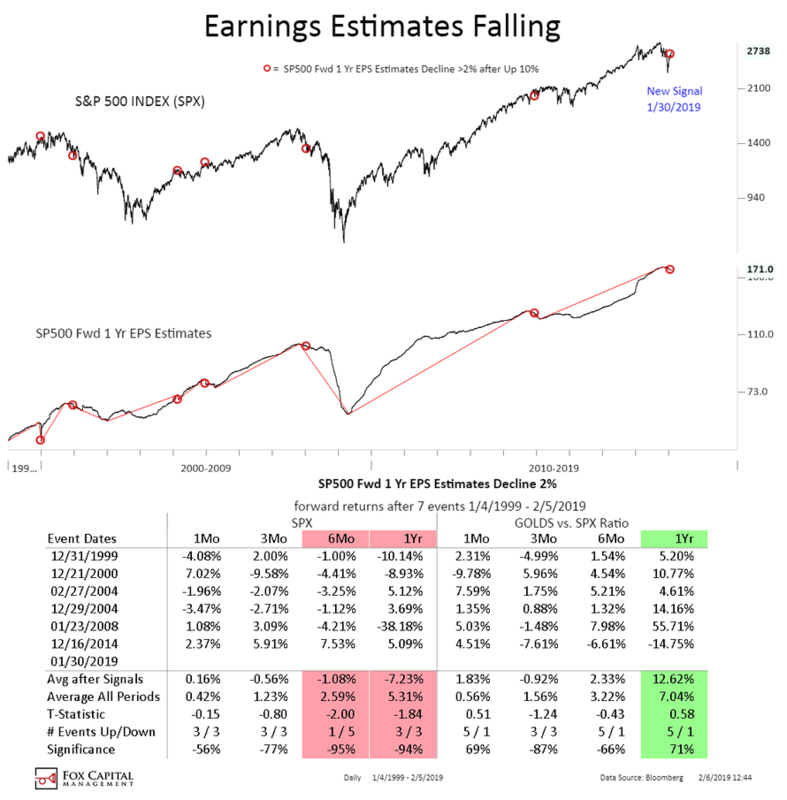 Forward earnings estimates for the S&P 500 continue to decline, with many strategists now expecting 0% earnings growth in 2019. 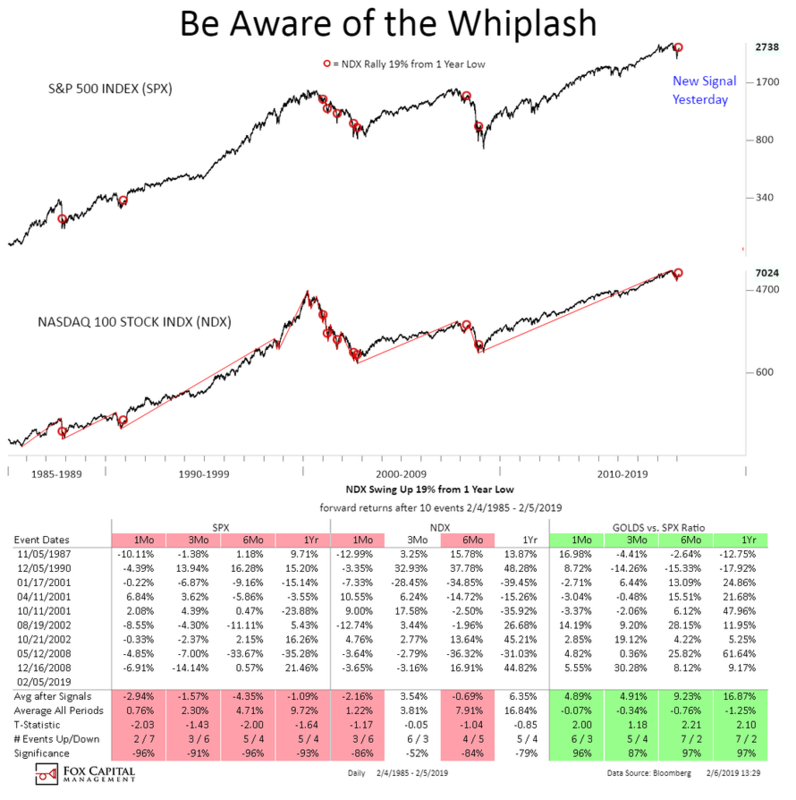 This significant downward revision to estimates coupled with a huge equity market rally now makes stocks look expensive again, so the valuation argument for bulls has quickly disappeared. With corporate margins still near record highs, if the global economy continues to slow, there is very little buffer to defend earnings if top line growth deteriorates further. Unfortunately, since corporate America has gotten so good at cutting costs immediately when pressed, we could also see unemployment spike very quickly as companies adjust payrolls to combat weaker growth. Our bear market roadmap continues to forecast far lower prices for equities in the months ahead. 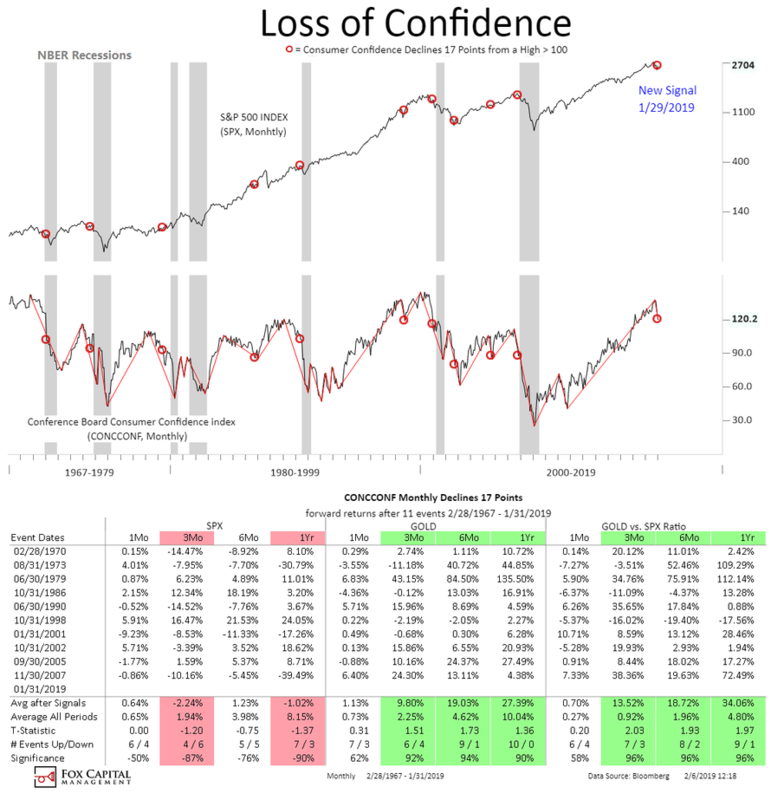 We do not believe that the 20% decline we had in Q4-18 was just a shallow bear market, and that stocks are already reflecting a recovery in global growth later this year to begin a new bull market. 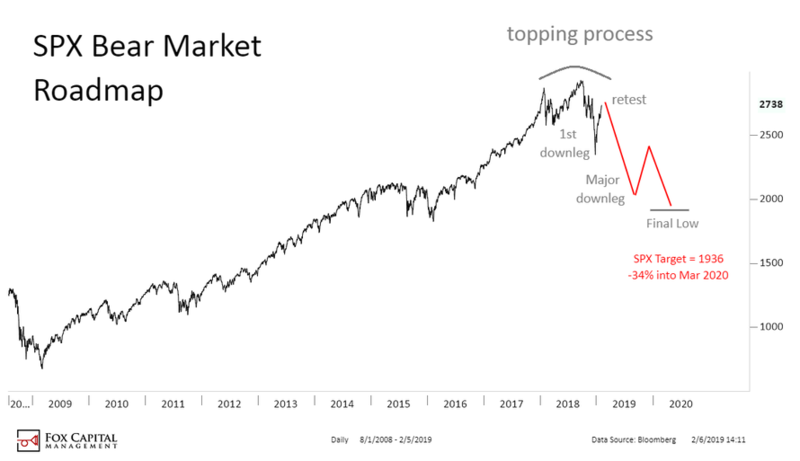 Given the technical set-up, the nature of the market’s pattern and the fundamental deterioration we are witnessing in real-time, we just don’t believe it will be that easy. It is far more likely that the deflationary down-cycle that began last year will persist throughout 2019 and 2020 before another inflationary cycle can gain ground. Let's be careful out there, and as always, stay thirsty my friends.